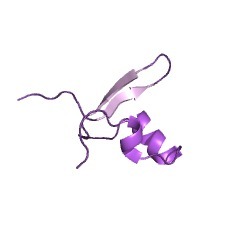 This entry represents the C-terminal domain of the H-NS DNA binding protein. It is composed of an antiparallel beta-sheet, an alpha-helix and a 3 (10)-helix which form a hydrophobic core, stabilising the whole structure. 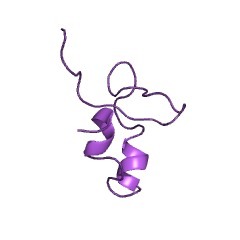 This domain has been found to bind to DNA [(PUBMED:7875316)]. 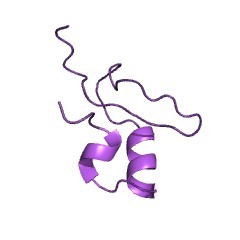 There are 5250 HNS domains in 4868 proteins in SMART's nrdb database. Taxonomic distribution of proteins containing HNS domain. This tree includes only several representative species. The complete taxonomic breakdown of all proteins with HNS domain is also avaliable. Click on the protein counts, or double click on taxonomic names to display all proteins containing HNS domain in the selected taxonomic class. 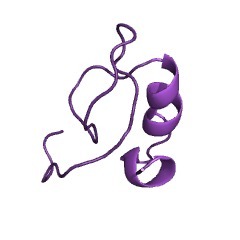 Solution structure of the DNA binding domain of a nucleoid-associated protein, H-NS, from Escherichia coli. 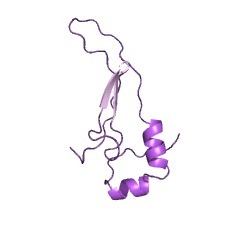 The three-dimensional structure of the C-terminal domain (47 residues) obtained from the hydrolysis of H-NS protein with bovine trypsin was determined by NMR measurements and distance geometry calculations. It is composed of an antiparallel beta-sheet, an alpha-helix and a 3(10)-helix which form a hydrophobic core, stabilizing the whole structure. 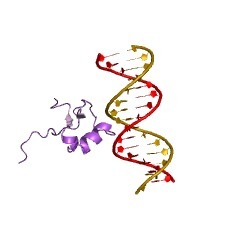 This domain has been found to bind to DNA. Possible DNA binding sites are discussed on the basis of the solution structure of the C-terminal domain of H-NS. 2jr1 Solution structure of the DNA binding domain of a nucleoid-associated protein, H-NS, from the phytopathogen Xylella fastidiosa.